Kid Icarus has finally seen the light of day once again after a very long, 20 year wait. Going from the Game Boy to the 3DS is one hell of a leap. Sure, the young angel might be out of practice, but that does not mean that his return to the video game scene is lackluster. In fact, this game is just brilliant in how it does everything. So, let us talk about the game's single player mode. The game starts off with a nice little tutorial video that sort of introduces the amazing cast of voice actors. After the tutorial, you hear Pit say, "Sorry to keep you waiting!" before flying off and beginning his adventure. The single player mode is composed of two types of gameplay styles: air and land battles. Air battles always start off each and every chapter of the game. These air battles are on-rails shooting segments. Basically, the player controls Pit's movement and fires at wave after wave of enemies, while trying to take as little damage as possible. These segments are usually the most impressive looking portions of the game, simply because it is breathtaking to fly at high speeds through the air over fields of grass or the enemy's fortress. The places that these air battles take the player are both unique and very memorable portions of the game, mainly because they take you to places that the land battles cannot. The land battles play like a third-person shooter. This is pretty much where the nine weapon types' various play styles is going to really matter. What weapon the player chooses is going to determine how Pit fights, and how the player is going to tackle enemies in combat. Plus, the weapons get better: each weapon has its own different stats and abilities, and the player can even try weapon fusion to get a hold of better weapons and make something to their own liking. So expect to spend some time just trying to find that perfect weapon and play style. Land battles are going to be the more challenging portion of the game for most players, and for a couple of reasons, the first of which is the fact that enemies are tough. Most of them are pretty basic, but the fact that the player is forced to handle so many at once can get a little brutal at times. However, just because something is hard does not mean that it is such a bad thing. In fact, everything is manageable once the art of dodging has been mastered. Plus, add in the constant chatter of the characters that gives you tips and tricks on how to defeat the more challenging enemies of the game, and the player is pretty well-equipped. Now, as for the second reason as to why land battles are going to be more challenging is the controls. Not gonna lie, the controls are definitely something that the player is going to have to get used to. The controls do work flawlessly, but the learning curve to use them may scare off some players, or just give them the wrong idea about the game. The good news about the controls is that the player can customize them to their liking. So players are bound to find something that they will be comfortable with. As for left-handed players like myself who want to use the Circle Pad Pro (sorry right-handers, but the Circle Pad Pro is a lefty thing only) just keep the movement selected to default, and the Circle Pad Pro can be used. Now then, let us talk about what makes this game so special: the voice acting. The voice acting brings all the characters closer to you. They are never really at a loss for words, which helps a lot, as the levels would be boring if they only said something every now and then, or nothing at all. These characters will always make the player laugh or give them plenty of game play tips to aid them in their journey. This lighthearted talk is what makes the game's single player campaign special. The player can miss some of the dialogue though, since the action can get pretty intense at times, but a pair of headphones coupled with subtitles on the top screen will fix that problem easily. Finally, it is about time for the multiplayer. The multiplayer allows you to take weapons and abilities that you have earned throughout the single player story and bring them into multiplayer. The same can also be said about multiplayer: you have the potential to earn some pretty valuable items, abilities, and idols (the game's version of the trophy system found in Super Smash Brothers) based on how well you do. The player can battle with up the five other players in local wireless play, or choose to play online with friends or anyone. The game's multiplayer is divided into two game types: a basic Free for All match, in which six players fight it out until time runs out, the player with the most points at the end of time wins, and Light vs. Dark, a game type that puts a spin on team play. So, the good part about the multiplayer is that the game is only focused on finding the player a match if he/she selects With Anyone. I am also pleased to say that the multiplayer is both fun to play and has very minimal lag. Sure, lag happens here and there, and the frame rate might drop due to multiple players using abilities, but overall, its one of those multiplayer experiences that actually wants the player to keep on practicing so that they can receive the better prizes in it. 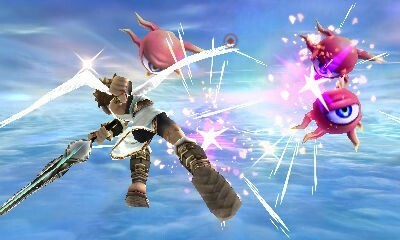 There is so much to do in Kid Icarus: Uprising that I do not want to spoil it all. However, this is just one of those games that are so fun that you will just keep on coming back for more and more, as every time you play Kid Icarus, it is a new adventure.